Published September 2015 by Hot Key Books. Goodreads Synopsis: When sixteen-year-old Toria Bland arrives at her new school she needs to work out who her friends are in a crazy whirl of worry, exam pressure and anxiety over fitting in. Things start looking up when Toria meets the funny and foul-mouthed Polly, who’s the coolest girl that Toria has ever seen. Polly and the rest of the ‘alternative’ kids take Toria under their wing. And that’s when she meets the irresistible Nico Mancini, lead singer of a local band – and it’s instalove at first sight! Toria likes Nico, Nico likes Toria, but then there’s Polly…love and friendship have a funny way of going round in circles. My Review: I’ve been excited about this book for such a long time. I’ve been a fan of James Dawson’s books ever since his first horror novels – to see him delving into another genre is really exciting, and he’s done so excellently! I adore how Dawson writes his characters, and All of the Above definitely has some of his best. I loved the friendship group the story is centered around so, so much – each character was really unique and although the book wasn’t that long, each character was really well developed and explored. Kudos to James for writing a great story where characters just happen to be queer / PoC, without the story being entirely about that. We need more books like this. I really loved Toria, she was an incredibly relatable protagonist – from her tumblring to her exam pressure, to her process of figuring life out, she just really resonated with me, so I’m sure she’s going to be well received by other readers. 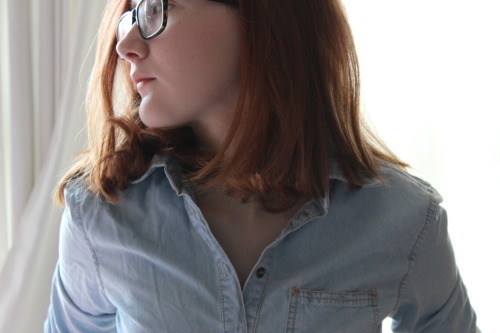 Polly was an awesome character: Strong willed, stubborn and completely wild, she felt like a mash-up of John Green’s Margot and Alaska, though was completely unique. The romance side of the book is brilliant – Toria falls for the local band’s lead singer, Nico, and for a while things are going great. But Polly, Toria’s best friend, is beginning to mean something else to her. The relationships felt so raw and realistic. I think the ways they progressed was perfect, and beautifully written. The back of the physical copy of the book says “It would be neater, wouldn’t it, if this was a story about self harm or sexuality or eating disorders or ridiculously hot bass players, but it’s a story about all of them. Yeah, it’s a mess. And it’s about to get messier.” Sidenote: Most fantastic blurb ever. And the fact that ‘it’s a mess’ is the reason this book stands out. So much happens. There are parts that will make you grin from ear to ear. There are parts that hit you really hard, parts that will make you cry. Some elements are wrapped up perfectly at the end. Some things are never resolved. But that’s the best thing about it – it’s not sugar-coated and nothing is perfect. And that’s what makes this book perfect. Overall, All of the Above was an exceptional book, and I can tell it’s going to be loved and related to by a lot of teenagers. As much as I loved James Dawson’s horror YA, (and would love to read more of the genre from him again) I can tell his ‘phase two’ is going to be awesome. Dawson covers so many topics in this book, and so well, it’s admirable. I really recommend this, and I can’t wait to see what’s next. 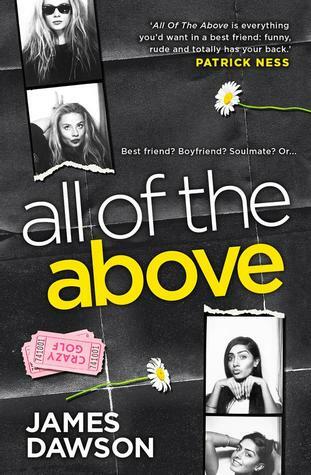 I received a copy of All of the Above from the publisher, via Netgalley, in exchange for a review. In no way at all did this affect my thoughts. This entry was posted in Uncategorized and tagged all of the above, book, book review, contemporary, cruel summer, fiction, james dawson, lgbt, say her name, teen fiction, ukya, YA, ya fiction on September 4, 2015 by keithbwalters. This sounds amazing! Can’t wait to read it!